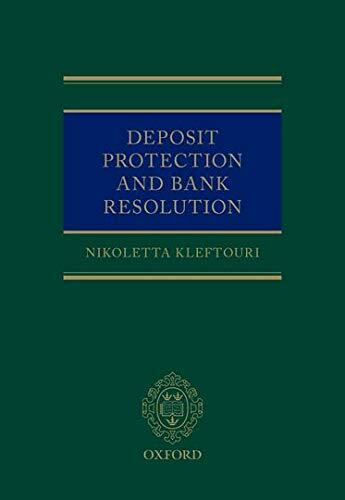 This topical and accessible work analyses the deposit protection and bank resolution regimes in the EU and UK. The book examines key amendments to the regulatory framework post crisis, such as the Bank Recovery and Resolution Directive, and the impact of these changes on banks, legal practitioners and regulators. The book provides an assessment of current deposit protection schemes and insurance in the context of financial stability, and highlights the UK regime's limitations in relation to the US and EU systems, and possible areas for reform. All issues relating to deposit protection schemes are covered, providing a comprehensive analysis and comparison between the UK, EU and US regimes. Most importantly, a novel approach is followed, which addresses the much discussed objective of financial stability from a different perspective: by enhancing and focusing on depositor protection.